Nerdwatch! » artistic things! » Klingon Style! By Captain Nerd | September 30, 2012 - 12:50 pm | September 30, 2012 artistic things!, cool things!, cosplay things!, dumb things!, musical things!, neat things!, strange things! Okay, now this is why I love the Internet! 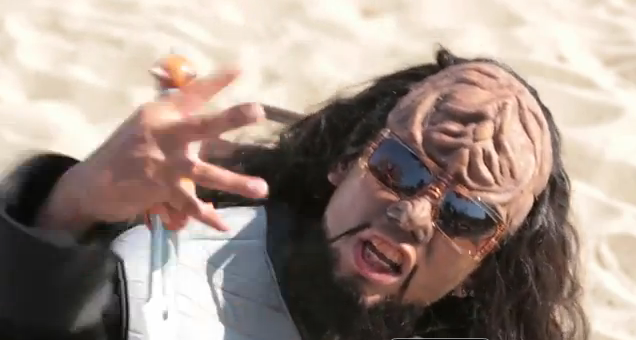 These fans took “Gangnam Style” and translated it both linguistically and visually into Klingon! I don’t know if the Klingon is accurate ^__^ , but at least it works! I love science fiction fans, and the technology that lets them create these, and lets us know about them! Tagged cosplay, fan parody, Gangnam style, Klingon, Klingon style, music video, Star Trek, Trekers, Trekkies. Bookmark the permalink.